Even the most hard-hearted F1 fan will be desperately waiting for this weekend's race, after five long weeks of summer break. The drivers have been off on their holidays, but have returned to their strict training regimes to prepare for the return to action in Belgium. The action in Spa is usually pretty good, the weather changeable, and the drivers desperate to show what they can do. That sounds like a recipe for a good racing weekend to me! Fernando Alonso heads up the driver's championship but it's by no means a dominant lead. Red Bull, meanwhile, have a firm grip on the lead in the constructor's battle as the teams behind them chop and change. There was an enforced two week shutdown during August, but aside from that the teams have been free to come up with new and ingenious ways to make their cars go that little bit faster. Spa causes chaos by its very nature, and the back-to-school feeling could add some drama to the weekend. Support racing for this event includes GP2, GP3, and Porsche Mobil 1 Supercup. You'd be silly to assume there will be no rain over the Belgian F1 weekend, but the long range forecasts suggest that race day might see some sunshine. There's talk of showers during Friday practice, with the weather turning sunny, if a little cloudy, over the weekend itself. Of course, that is sure to change as the Spa circuit can have its own microclimate at times. The activation point for DRS this year has been modified slightly, moved 50m later than it was in 2011. The overall position of the DRS is similar, though, and last year, the system came under some criticism that it made overtaking too easy. Stefano Domenicali was particularly vocal about the "foregone conclusion" that overtaking became, whilst Martin Whitmarsh took the opposite view. He was more of the opinion that the fans wanted overtaking, and had to take the rough with the smooth. Although DRS is allowed throughout the lap during practice and qualifying, it is banned up and over Eau Rouge, in the interests of driver safety. Formula One drivers rave about the Spa-Francorchamps circuit, even Kimi Räikkönen likes it! In an increasingly Tilke-based calendar, Spa offers a respite from medium-speed corners. It offers sweeping curves, long straights and elevation changes. 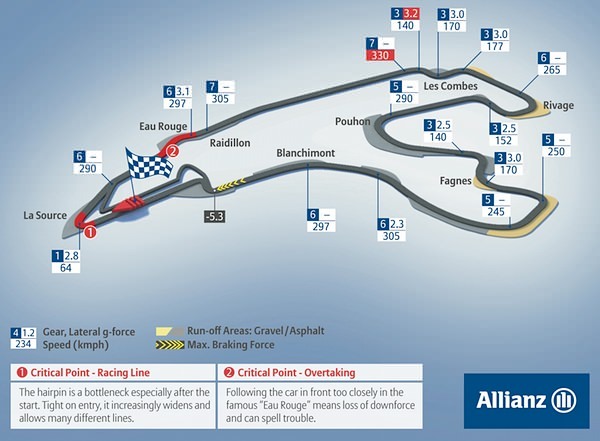 Given Spa's tendency to provide it's own weather, and the length of the track itself, it can be raining at one end of the circuit and not at the other. 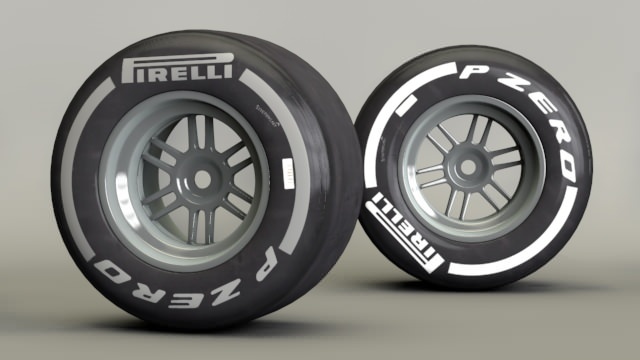 The challenge in managing tyres, strategy and setting up the car to be good in all conditions can be a real headache for engineers. There have been a few superficial changes to the track since 2011, with more artificial grass installed, and the FIA insisting on their own approved paint for the white lines. Some drainage areas at turns 9 and 10 have been levelled off, too. It’s certainly one of the most demanding circuits that we face all year, because of the high speeds and extreme forces involved, which are often acting on the tyres in more than one dimension. The nomination of the hard and the medium tyres will allow drivers to push hard from start to finish, which is what Spa was designed for. Next post Constructed from... Lego bricks!